Dr. McCoy has been a life long animal lover and has been thoroughly in love with horses since she can remember. She began riding at a young age, participating in Pony Club until her mid teens. While in pony club Thais went to Dressage nationals with her first horse "Bubba," where her team won in horse management. Dr. McCoy attended Colgate University in central NY for undergraduate school earning a degree in molecular biology (with a minor in art and art history). There she competed in the intercollegiate horse show association acting as one of the team's captains for two of her four years riding with the Colgate team. After college Dr. McCoy enjoyed working as a veterinary technician in a small animal hospital. During that time she also adopted two off track thoroughbred to train and compete. In 2006 Dr. McCoy packed up her animal collection to move to Prince Edward Island in Canada to attend the Atlantic Veterinary College. While at AVC Dr. McCoy was fortunate enough to take 4th year rotations taught by Dr. Ortenberger in both veterinary chiropractic and acupuncture as part of her clinical training. 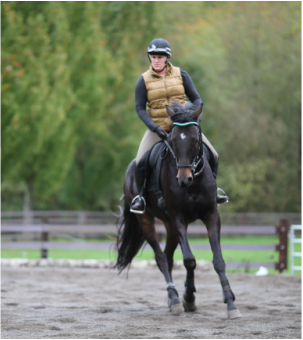 After graduating from veterinary school Dr. McCoy moved to western NY to work with an equine exclusive practice where she gained a lot of experience in allopathic veterinary medicine. In October 2012 Dr. McCoy and her animal family packed up once again to move to Washington to start up her own complementary medicine practice. During this time Dr. McCoy attended the Options for Animals veterinary chiropractic school attaining certification from the International Veterinary Chiropractic Association as well as attending the Chi Institute to study acupuncture and traditional chinese veterinary medicine. In may 2015 Dr. McCoy decided to undertake training in saddle fitting both through the society of master saddlers and the North American Saddlery School. This new skill has been a rewarding way to continue to help our equine partners perform their best. Thais is very excited to be able to be able to combine her traditional veterinary experience with her knowledge in complementary medicine and saddle fit to help you and your veterinarian achieve the best possible health for your animal. In her spare time Thais likes to work with her four off track thoroughbreds, spend time with her cats, italian greyhounds, chickens, daughter Allondra and boyfriend Andy. She is very excited to make time to explore Washington and maybe even do some gardening.